(516) 781-1800 if you have any questions - We're here to help. 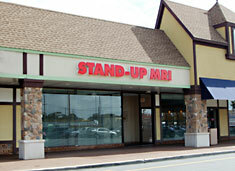 Stand-Up MRI of Wantagh was established in August, 2013. The facility is equipped with the Stand-Up® MRI scanner, manufactured by FONAR Corporation in Melville, New York. Stand-Up MRI of Wantagh is actually our “dba” or “doing business as” name. Most insurance carriers know us by our incorporated name, Comprehensive MRI of New York, P.C., but some carriers know us only by Stand-Up MRI of Wantagh. For clarification, see insurances. Comprehensive MRI of New York, P.C. is owned by Robert J. Diamond, M.D. We accept Medicare, Medicaid, Workers’ Comp, No-Fault and most other insurances. If a patient’s insurance is not on our insurance list, inquire about out-of-network prices. If a patient does not have any insurance, inquire about cash prices. Monday - Friday: 8:00 a.m. – 8:00 p.m. Appointments outside of regular business hours are available upon request.